I recently started developing on magento2 new extensions or customizations, and my first impression was a nightmare. I have to wait about 20-30s for every change I make? really? I'm talking about development mode, I know that in production with cache enabled and other things the website can be smooth. But when I'm working with an extension or layout problem I need to be removing static files, clearing cache, etc. What is happenning exactly? Usually M2 responds okay, slow but okay, about 5-10s to load the pages, but sometimes (more usually than sometimes) it just stucks forever! sometimes is the first page and sometimes are the css,js,html files but always the problem is with TTFB. These 2 pictures are about navigating inside setup wizard. Seriously, I don't know what has this vm, but goes really fast. I tried creating my VM using a fresh installation of Ubuntu, CentOS, etc. But no works so fine like this VM. 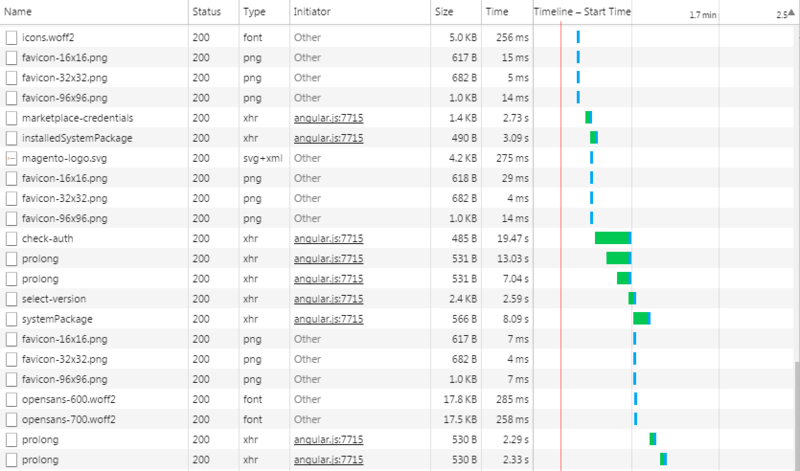 Also see this guide on how to improve Magento 2 performance. Magento recommends installing and using the latest supported version of PHP 7 to increase performance. Replace your MySQL database with Percona. Make sure you install and enable PHP OPcache. Xdebug is off by default. Enable this feature only when you need it because it requires a lot of memory and degrades performance. The xdebug.max_nesting_level configuration needs to be set to 200 or greater for Magento. You can increase the memory available to PHP to get an increase in performance with Xdebug on. If you need sample data, you can install it using composer or by cloning repositories. Make sure caching is turned on (this is the default behavior). Generally, only page cache and block cache should be turned off for development and turned back on when testing. Opcache timestamp validation should always be on for development. Development is impossible with opcache on and revalidation off because any PHP modification would require a cache reset. This was the above that I chose to cache whilst developing on the Checkout, as this was heavily front-end. I chose to not cache Layout; Blocks and Full page to see my changes. Go to <your magento 2 directory>/bin and run this command magento cache:enable. Clean the cache when you edit the frontend to see what you've edited. Go to <your magento 2 directory>/bin and run this command magento cache:clean. I'm new to magento 2 too. 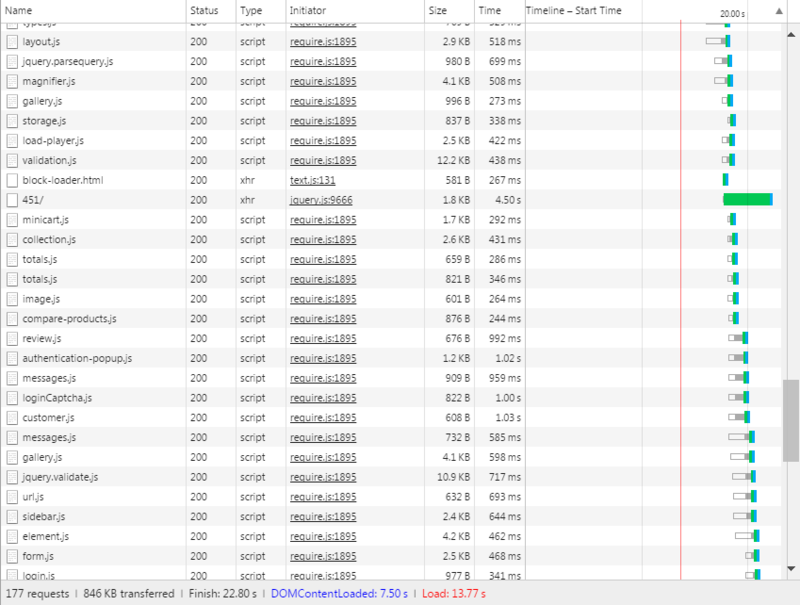 I hope someone has a way to make magento 2 fast even when the cache is disabled. Increasing PHP memory_limit in php.ini file will make good difference. However it won't make it very very smooth(Although it will save time). The default value is 512M. On my local machine I set this at "-1"(unlimited) and it gives better loading time. The recommended value is memory_limit=2G mentioned here. If your having problems setting up on a Vagrant box, it will almost certainly be how your folders are shared. They should be shared over NFS. After messing around with lots of different boxes, I realised that although I had set NFS in the config, it was not actually working and the standard VirtualBox sharing system was taking over. Confirmed NFS was working and all was well. Things that can make your Magento 2 setup fast on your local server or in general on any server enviroment. Use a caching application like Redis or Memcached. Enable all the cache like block_html, layout, page_cache etc provided by Magento 2. Enable flat products and categories. Now when on the development enviroment flush only the needed cache instead of flushing the whole cache to prevent the whole rebuild of cache. Not the answer you're looking for? Browse other questions tagged magento2 performance development localhost or ask your own question. magento 2.1.7 how to access from another device on localhost? What's the point/gain/advantage of knockout.js in Magento 2? 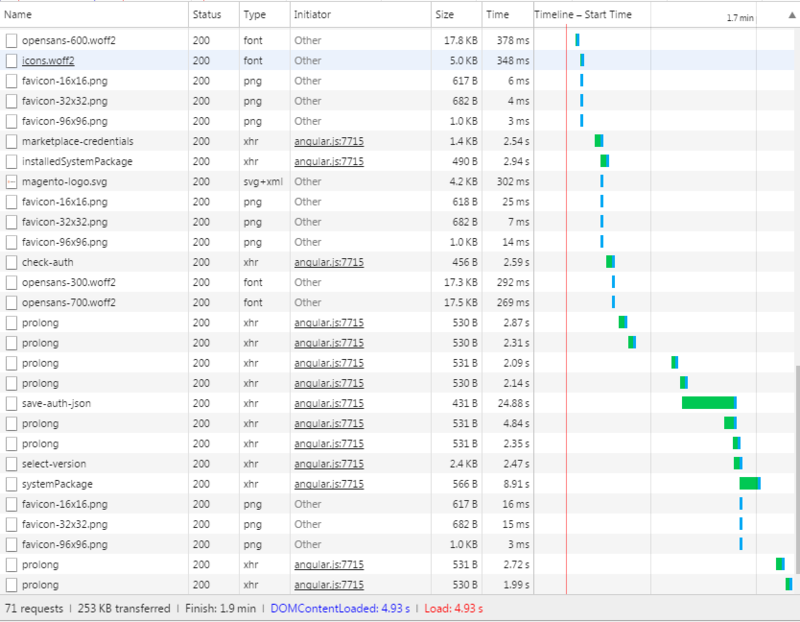 Magento 2 : Development is extremely slow? why my magento 2 localhost setup in very slow?